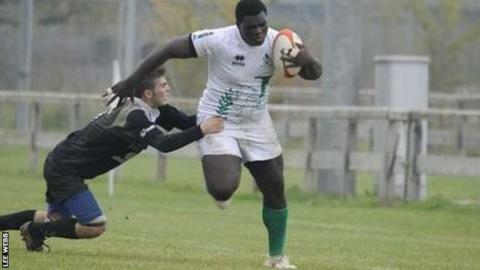 Worcester Warriors have signed Italy Under-20 prop Derrick Appiah. Appiah, who can play loose-head or tight-head, has featured for Mogliano in Italy's National Championship of Excellence and for Parma and Modena. "My ultimate goal is international rugby. Moving to Worcester is a great opportunity to become even stronger," the 20-year-old said. Worcester have also handed professional contracts to academy trio Perry Humphreys, Huw Taylor and Sam Smith. Worcester now have two Sam Smiths in their squad. Winger Sam Smith, 24, arrived from Harlequins last summer. Flanker Sam Smith, 18, has come through the ranks at Sixways. To distinguish between them they are called 'Senior' and 'Junior'. Although, as a club spokesman said, that "could soon get very complicated as Junior is very talented". Humphreys, 20, who can play at full-back, wing and centre, made his Championship debut in the victory at Rotherham in October. Taylor, 18, who was named in the England Under-20 Elite Player Squad before Christmas, can play in the second row or back row. He has made four first-team appearances for the Warriors this season. Flanker Smith, 18, has also represented England, at Under-18 level.